Chicken wire was actually invented back in 1844 by an English ironmonger called Charles Barnard. He lived in Norwich which was a cloth weaving town. He took the basic principles from the cloth loom and applied it to wire and created a simple, cheap and easy way to keep small animals and poultry penned in one area. Nowadays most people use it to pen their chickens in and keep them safe. In this guide to chicken wire, we are going to look at the pros and cons of using it, when it is appropriate and when it isn’t. 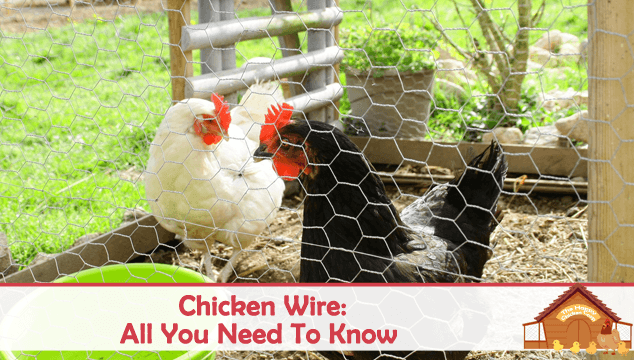 You can skip this section if you’re already familiar with chicken wire and know the differences between it and hardware cloth. 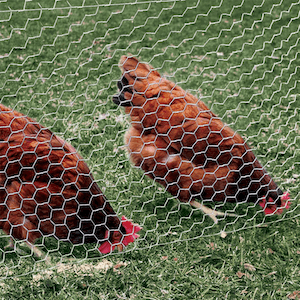 As chicken folk, we think of chicken wire as poultry mesh, but it has a variety of uses from poultry wire to rock-fall barrier and from craft applications to reinforced wire mesh. The chicken wire that we are familiar with is thin (usually 18 or 20 gauge) flexible wire that is woven into a hexagonal pattern. 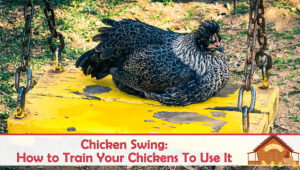 It is relatively cheap and easy to work with so that makes it attractive to many new chicken keepers. Remember as a general rule you only use chicken wire to keep chickens in, not predators out! Hardware cloth should be used to keep predators out (more on that later). Your coop is locked at night using raccoon proof locks. You are home most of the day to monitor your coop. The coop is fairly near to your house so you can easily see it. I do use chicken wire on some of my runs – all of the above is in play. The coops are locked and secured nightly. Either I or my dogs are in the yard frequently at random times. The coops are within sight and sound of the house. The key word here is random; foxes are known to study an area before attacking. They will look for weaknesses in routine as well – times when you aren’t home etc. One of the best applications for chicken wire is as an internal barrier in the coop or run area. It can safely and easily be used to separate flock members or introduce new flock members within the coop or existing run. You need something that will keep them apart but it doesn’t have to be super strong so chicken wire fits the bill nicely. I have also used it in making small carry cages for bantam birds for exhibitions. Some folks use it to cover the run area. It will deter hawks very well but will not keep out climbers such as raccoons. I have read that it can be used as a digging deterrent. Lay the wire on the ground surrounding the coop, and then cover with dirt and grass seed if desired. Once a predator reaches the wire they will stop digging. The wire should extend away from the coop for roughly three feet. 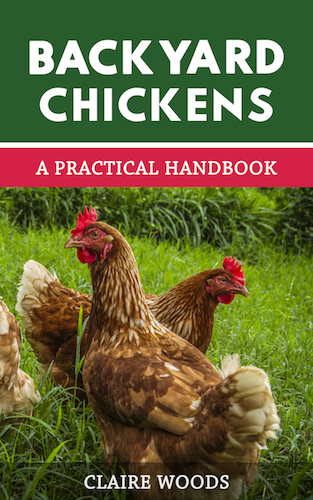 One of the best uses for it is to keep chickens out of your garden! It’s simple to erect chicken wire around the areas of your yard that you don’t want the chickens in and it will save your flowers and veggies from an ignominious end; death by chicken. Installation of chicken wire is fairly simple and straight-forward. You may need a friend to help you but it can generally be done by one person. Couple of bricks (or something heavy). Most videos show you the entire roll of wire being straightened out; if you have a large area that’s a great idea, but what if you only want 10ft or so? I unroll the wire to just beyond the desired length, hold the loose end down with bricks so it doesn’t follow you! At the designated length use your wire cutters to cut a piece about 2 inches longer than needed. Once cut, fold in the cut edge about 1 inch either end – this avoids sharp edges. Apply to the top of your frame and staple all along the top ensuring the wire is straight. Now do the same for the bottom edge pulling the wire taut. Once you have top and bottom done you can do the same for both sides, again, pulling the wire taut. If you are doing long runs of wire it does help tremendously to have an assistant, it will go much faster with a lot less cursing! It is not robust enough. The weave creates large holes through which predators can fit. Small chicks and bantams can get caught in the weave. A very hungry and determined predator (fox, raccoon, skunk and opossum) can tear or bite through the wire, as can larger predators such as coyote. After all, they have all night to spend getting supper! A raccoon can reach through the wire and grab a chicken and kill it easily, they are also very adept at ripping off chicken wire that has been used to cover windows and vents. Hawks too are able to grasp through the wire and tear at the chicken with its beak. The size of the weave allows weasels, snakes and rats to slip through the holes without any problem at all, although if the snake eats the eggs it is unlikely to be able to get back out again for some time! 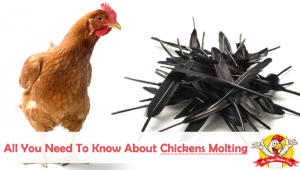 The holes are small enough for chicks to get caught in and the sharp edges can cut into adult chicken feet possibly causing bumblefoot. So, although it is called chicken wire, it does little to protect chickens, but it can be used in conjunction with other materials. This is the ‘go to’ material for keeping your flock safe and secure. 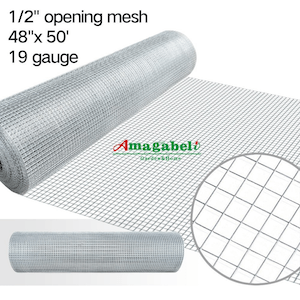 It is welded steel that comes in various sizes half-inch mesh being the most effective for chickens. Yes, it can be expensive, but there are a couple of tricks to help you reduce the amount of wire you will need. The places that you should always use hardware cloth are windows and vents. These are usually fairly small areas, but easy for raccoons, weasels and others to target. Any place in the coop where a predator might access needs to be covered with hardware cloth. If you have an enclosed run that you need to cover in wire there are a couple of things you can do to reduce your costs. Use hardware cloth from the base to the three foot mark. Then at the three foot mark, you can use chicken wire. Make sure you have an overlap of at least 6 inches and be sure to wire the two meshes together or cover the join with wood lathing. 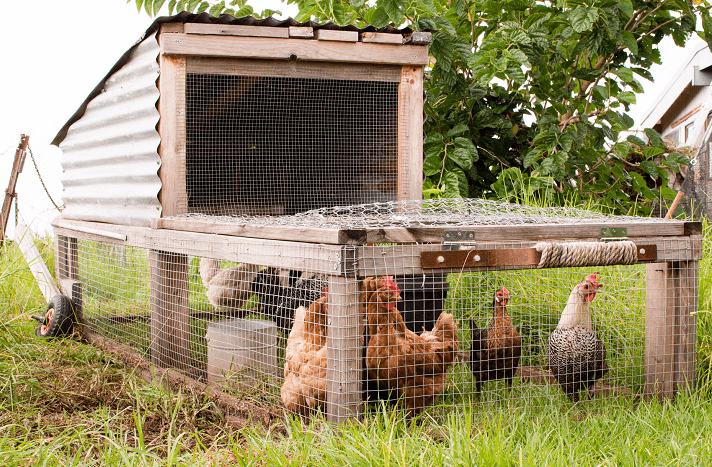 If your coop is raised off the ground, any outside perimeter will need hardware cloth from coop to just below ground level; spreading outward you can use chicken wire. This will save you a good amount of money, but always remember it is not predator proof. Animals are smart but when they come across hardware cloth they usually give up and go searching for an easier meal. This can be used as a separation barrier for chickens of differing ages while they acclimate to one another. 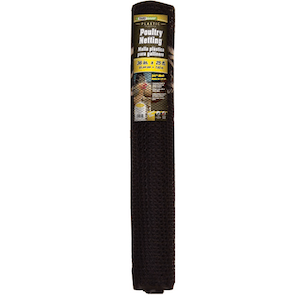 It can also be used as run covering, although if you are going to use plastic you may as well use either deer or bird netting over the top as it is cheaper and a bit easier to use. It can also be used to keep the chickens out of your flower or veggie garden. It is flimsy and easily destroyed; so despite optimistic advertising, it has no place in keeping chickens safe against predators. What is the difference between wire and mesh? Chicken wire is finer gauge wire that is woven together. Mesh is heavier gauge and is spot welded at the joints for a stronger bond. Will chicken wire keep out rodents? No, the mesh holes will allow mice and small rats or voles through the weave. Will chicken wire keep out foxes? No, foxes are strong and canny predators, chicken wire will not deter them. Yes, how quickly will depend on the circumstance in which you use it. It is good for about 5 years in a dry application. Yes it can. There are a couple of websites out there that show you how to do this safely. 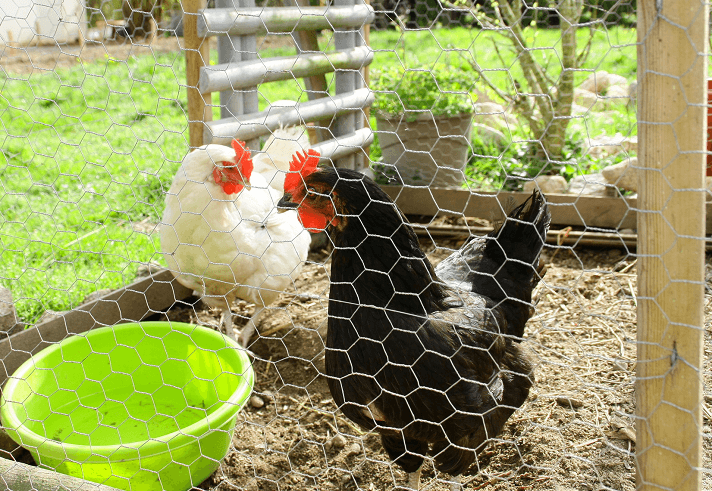 Despite its name, chicken wire has a limited use in keeping your flock safe and secure. As we have seen, it is possible to use chicken wire at certain times and in certain places. Obviously, if money is real tight and you have no other alternative then you should use it. The best defense is hardware cloth. As I mentioned earlier, I do have chicken wire in some of my runs but I also have extra security for the night times when most predators are out shopping for dinner. The most important thing is that your coop is secure at night – locked down with no opportunity for predators to gain access. The real take away point here is that you should not be relying on one thing alone to protect your flock! I wouldn’t use the plastic fence because they fall apart fairly easily. Plus a very small rabbit chewed a hole through it and the chickens kept on getting out until we switched to chicken wire fencing.